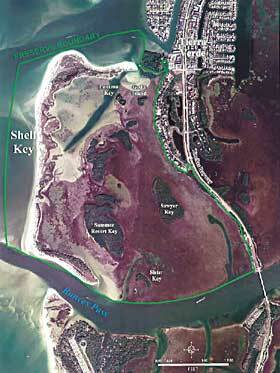 All Shell Key campers are required to obtain a Camping Permit. This 1,800-acre preserve protects sensitive marine habitats and includes one of the county's largest undeveloped barrier islands (Shell Key), as well as numerous mangrove islands and expansive sea grass beds. Shell Key has been designated as one of the state's most important areas for shorebird nesting and wintering and serves as an important study area for these species. It also is an important area for recreation. A balance for both uses was established by restricting public use to the northern and southern ends of the island. A central core area for conservation is closed to the public. Boating, camping, and beach-going activities are permitted in public use areas of the preserve, see designated areas and camping rules . No restroom facilities are provided. The closest boat ramps, trailer parking, and restroom facilities are located at Ft. DeSoto Park. Bird watching - Designated as one of the state's most important areas for shorebird nesting and wintering. It serves as an important study area for these species. Note: No restrooms available. Preserve is accessible only by boat. Dogs and alcohol are prohibited anywhere within the preserve boundary. All plants and animals are protected. Removal of live animals from the beach (sea turtles, sand dollars, conchs, starfish, fiddler crabs, etc.) is prohibited. Visitors to the island must be aware of how each part of the preserve is used. Stay clear of unauthorized areas. The former public use area located mid-island has been closed and incorporated into the Bird Preservation Area (BPA). 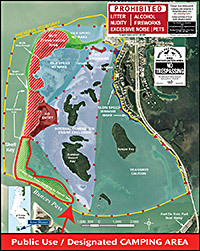 All overnight camping requires a permit issued by the County and limited to the southern public use area of Shell Key.